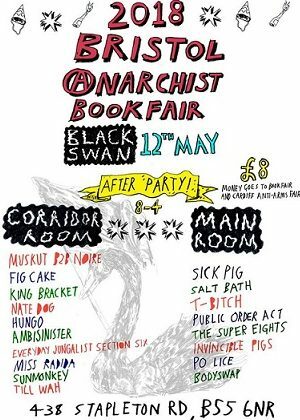 Saturday 12 May… After a day of books and workshops, the punk after-party of the Bristol book fair will raise money to fight against the Cardiff Arms Fair. 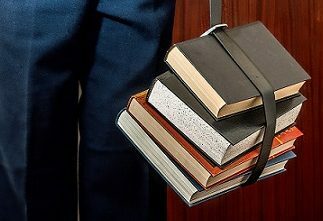 The Bristol anarchist book fair is an event organised by the “Bookfair Collective”, a group of active anarchists that came together in 2008, inspired to hold a book fair in the city. The key aims of this event are to promote a whole variety of anarchist ideas, while creating a space for discussion and debate for anarchists and like-minded people. However, for the 2018 edition, the collective had to cancel the event’s venue booking at the City Academy, as the Academy Trust – who manage the venue in question – have a sponsorship deal with Rolls Royce. In this context, it is important to know that Rolls Royce has developed a big business with the Turkish army, which is currently involved in offensive operations in the Kurdish region of Afrin, located in the north of Syria. Even if the book fair had to give up on its venue, a day full of books, workshops and anarchy will still take place. In order to fight against the production of arms and the Cardiff Arms Fair, the Bookfair Collective is holding a punk after-party that will take place in two different rooms of the Black Swan. While Carnival Punks will host the main room, the Pyratrix Circus will be getting lively in the corridor room, mixing rave and party beats. Additionally, Efa Supertramp and other acoustic bands will play music in the Black Swan’s garden. The event costs £8 and will take place on Saturday 12 May, from 8 pm. to 4 am. at the Black Swan, 438 Stapleton Road, Eastville, BS5 6NR, Bristol.